So, this blog is mainly about computer programming, software marketing, gadgets, probably some video games I'm playing...and also Quilting. My wife is an avid quilter. I can't sew--but all the algebra and geometry classes I've taken, plus just thinking in terms of pixels for a lifetime lets me be a big help to her for laying out and designing her quilts. In my head, quilts are made of large fabric pixels. Here is a design I did for her. The cuts divide the middle squares into 2/3 and 1/3 parts. Then just swaping and rotating the pieces. Geeky me, an animated GIF of the cuts and rearranging. She picked the fabric (she's better at that by far!) She made 4 of the 3x3 checkerboards using 9 inch squares. 2 with the "blue" fabric in the corners, 2 with the white fabric in the corners. 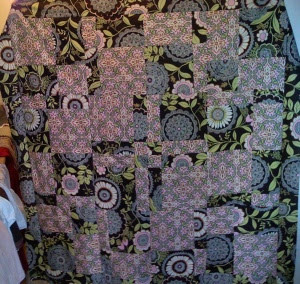 Putting all the pieces together in a mirror pattern ended up with this quilt. It looks like it takes a lot more work than it does!